In the last couple weeks I have noticed a rise in the number of grasshoppers in the garden and surrounding fields. I am not really surprised because last year we had hordes of grasshoppers. In fact, the grasshoppers were so numerous that more than a few people in these parts made allusions to the plague of locusts mentioned in the Book of Revelation and were sure it was yet another sign that the end of the world was near. Whether it was a sign of such great importance or not; I think we can be a little more sure of one thing and that is many of those grasshoppers laid eggs last fall that are responsible for the numbers of grasshoppers we are seeing today. The female grasshopper deposits pod shaped egg sacks just under the surface of the soil during the fall. 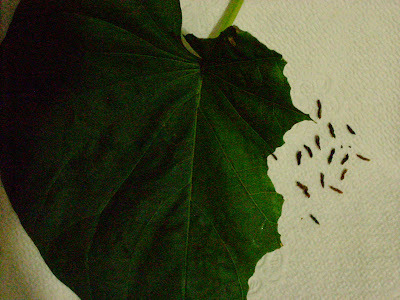 Each pod contains between 20 to 120 eggs! Each female grasshopper can lay between 8 to 20 of these pods! If the following winter and spring seasons are dry with less rain then more eggs will survive unharmed and more grasshoppers will hatch in the spring and more may come to maturity in the summer. Actually when you look at the numbers of eggs that one female grasshopper can lay combined with the drier Texas weather this winter and spring, you can see that the situation could be much worse this year. Perhaps this is also just the beginning of larger numbers of grasshoppers to come in August and September! A leaf on the left showing grasshopper damage and grasshopper feces on the right. Grasshoppers eat large holes out of leaves, or eat halves of peaches or other fruit while they are still hanging on the tree, etc. They leave tell-tale oblong feces beneath where they have been eating. 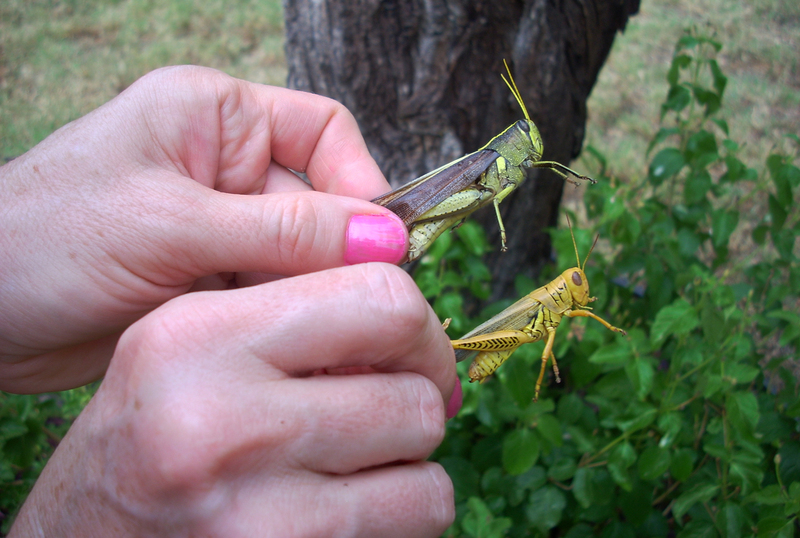 Grasshoppers like to stay in tall grasses, weeds and tall crops like corn and grains. Therefore, it is good to keep your garden weeded and free of tall grasses so they will choose to hide out in tall grasses and weeds instead of the usually shorter, less dense garden plants. Another useful organic control measure is to mow a patch of grass between your garden and the surrounding taller plants. Grasshoppers are more vulnerable to predators in open areas because they are easily seen. 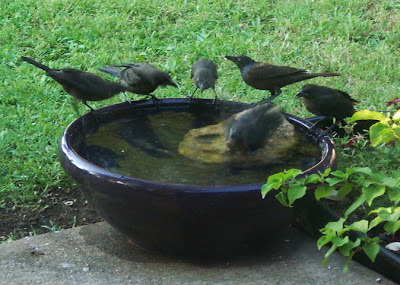 Grackles taking turns bathing in the birdbath. Grackles are grasshopper eating machines. Birds are your best allies for controlling grasshoppers organically. It is in the gardener’s best interest to make their yard and garden a haven for birds so that the birds choose to live in and or visit your yard every day. The best way to create a bird haven is to provide food and water on a regular basis. Put out bird feeders and fill them with sunflower seeds or even plant sunflowers near your garden. I prefer to provide sunflower seeds instead of the typical bird seed mix because it attracts more helpful birds and less sparrows. I do not want to attract sparrows because they demolish pepper plants and Swiss chard by eating the leaves! Provide one or more water sources for the birds. Some of the most voracious grasshopper eating birds are mockingbirds. Mockingbirds are not feeder birds, but will be drawn to your garden by water sources, but also tomatoes and berries. If you have tomatoes and berries, cover them with netting to protect them from mockingbirds. You just have to let the birds know what vegetables and fruits you want to keep for yourself and then your relationship is great ; ). You don’t have to buy expensive stone birdbaths to attract birds. One of the most successful birdbath models is a plastic dish pan with a rock in it. I have two birdbaths in my backyard. One is a blue plastic dish pan on top of a 6’ tall tree stump. Doves, cedar waxwings, wrens, and mockingbirds love this model. The other birdbath is a large ceramic dish that is about 2.5’ in diameter with a large rock in it that sits on the ground. Birds that love this ground model are grackles, cardinals, robins and bluejays. This birdbath is located in an open spot where no cats can ambush the birds. It is very important to put a rock in the birdbath on the ground. The rock provides a ramp into the water for the birds to choose the depth of water they want to wade into to bathe. The rock serves another very important function; it is a ladder for young birds that will learn to drink water for the first time from your birdbath on the ground. These young birds will choose this birdbath because they can reach it easier than a tall birdbath. Young birds with very short wing and tail feathers may also slip off the edge of the bowl and drown if there is no rock to swim to and make their way out of the water. Your birdbath on the ground is a life saving water source for young birds that have just left the nest. *Change the water in birdbaths every day or two days to prevent any mosquito eggs that may have been deposited in the water from hatching. 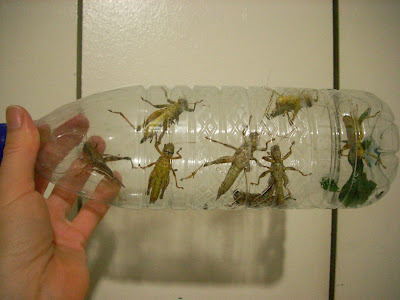 Grasshoppers captured over a 3 day period and put in a bottle to transport out of the garden. While the birds are controlling most of the grasshoppers and their destruction is minimal, I have found an additional 2 or three of them in my garden each evening while watering. I spray the bamboo and corn with the water hose. If there are grasshoppers in there, they will fly toward me. I then catch them with a cupped hand while they are readjusting in the spot where they have landed. Don’t cast your shadow on them and you will be more successful catching them. Hold the grasshoppers by the back legs (as shown in the top pic), to prevent them from jumping or clinging to you with the 4 front legs and getting brown juice on you. They secrete a brown juice from their mouths when they feel threatened-it is harmless. 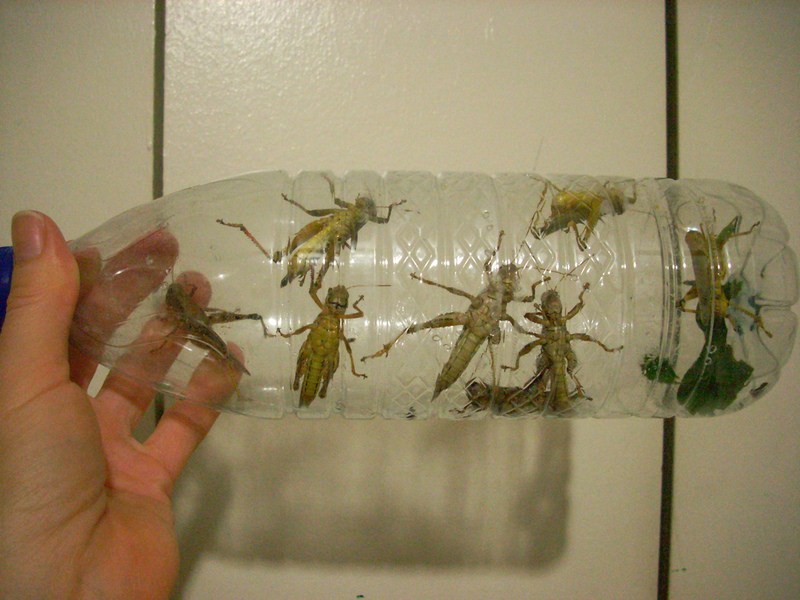 After catching the grasshoppers, I hold them by their back legs while I put them in plastic bottles head first. The bottles have air holes punched in them (don’t use a sharp object to punch holes in a direction toward your hand). The small mouthed bottles work well because you can easily add more grasshoppers to the bottle without any hopping out because only one grasshopper can fit through the opening at a time. You can then relocate the grasshoppers from your garden if you are a non-kill organic gardener and or worried about your karma ; ). I give the grasshoppers to my neighbor who is an avid fisherman. He keeps them in a terrarium and feeds them well before using them for fish bait ; ).